← Convert prn to pcx and rotate page via command line? PowerPoint is excellent in doing the presentation but it is a little weak in uploading because it is big in size. Then how can get the presentation effect but make the file little in size? Now I will show you a way to achieve this aim. Convert PowerPoint to image and compress it. docPrint Pro can help you finish the whole in three second. Please allow you to show me my way to do the conversion from PowerPoint to image, say PowerPoint to tif using software docPrint Pro. I will say one word or two about docPrint Pro. It either a file format converter or a printer driver. When you use it as a printer driver, it can help you do the printing economically and efficiently. 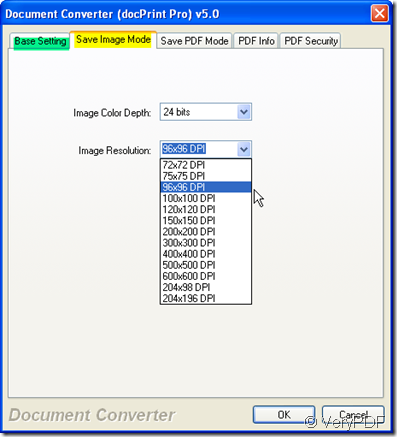 When you use it as a converter, it can help you convert all the printable file to image file or PDF file. Visiting its website to know more about file format converting. If you need to have a free trial, please download it here. Detail steps for converting PowerPoint to tif. Once you download docPrint Pro successfully, there will be a icon which looks like magnifier show up on the desktop. Double click it then you can let it work for you. Say try to convert PowerPoint to tif. Add your PowerPoint to docPrint Pro by simply dragging from its folder. Choose the output file format as tif as we need to convert PowerPoint to tif. Also you can choose your output format as eps, jpg, pdf and others. If you need to adjust the color depth and image resolution, please go to “save image mode sub label”. The last step is to click the button “Start” to end the conversion. And choose a place to save the converted tif file. Three seconds later, you can get your PowerPoint in the format of tif file. How to convert documents of MS PowerPoint to postscript? 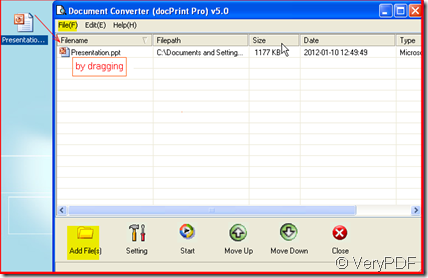 How to use docPrint PDF Driver printer to convert PPT to EPS format? This entry was posted in docPrint Pro and tagged docPrint Pro, PowerPoint, powerpoint to image, PowerPoint to tif. Bookmark the permalink.